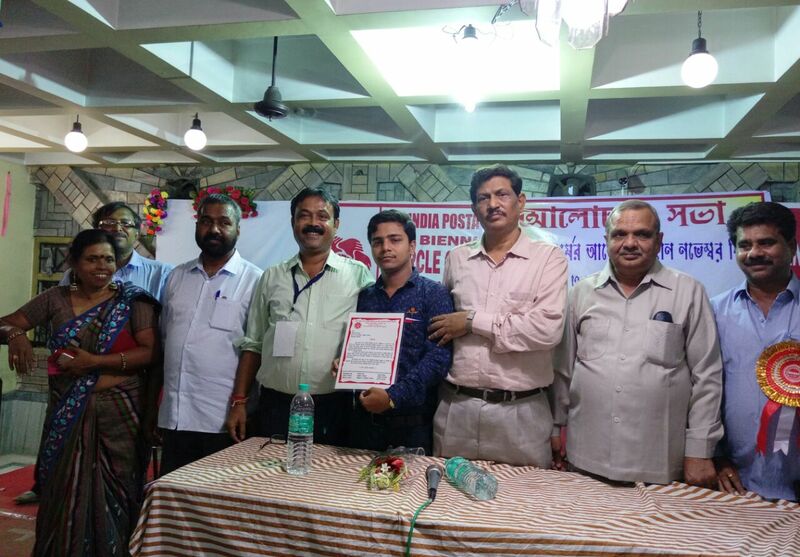 The postal circle unions of west Bengal, during the biennial Circle Conference from 4-7 Nov 2017 at Rishi Bhawan, Siliguri, have felicitated Com. Pranab Das, 26 yrs, GDSBPM, Kantore B.O. (Dinajpur Division), for his act and gesture of exceptional sacrifice and comradeship in the shape of donation of his organ (liver) to save the life of Com. Debkumar Mukherjee, PA of same Division who was suffering from liver cancer and was in requirement of immediate liver transplant. Com. M. Krishnan, S.G., Confederation, has handed over flower, a gift and an appreciation Certificate to Com. Pranab Das. Entire house has given him standing ovation. Com. R.N.Parashar, S.G., NFPE, Com. Vikram Shah, offg. G.S., P-IV and Com. Pandurangarao, G.S.,AIPEU GDS, were also present on the dias and greeted the young comrade with appreciative words.